Arteries and veins are blood vessels that run throughout the body. They carry blood to and from the heart. Damaged blood vessels result in poor blood flow, known as peripheral vascular disease (PVD). PVD is a circulation disorder that involves any of the blood vessels outside of the heart. Peripheral vascular disease prevents parts of the body from getting sufficient blood. The legs and feet are particularly affected by this disease. Left untreated, vascular disease can lead to disability, amputation, organ damage and even death. Aortic Aneurysm: A gradual weakening of the aortic wall that causes a bulge or rupture. Aortic Dissection: The inner layer of the aortic wall tears and then separates away from the middle layer. Buerger’s Disease: A rare disorder of blood vessels in the arms and legs. Arteries and veins become swollen or blocked with blood clots, leading to tissue damage, pain and infection. Carotid Artery Disease: The carotid arteries deliver blood to the brain. When fat deposits clog these blood vessels, the blockage can result in a stroke. Critical Limb Ischemia (CLI): When the arteries become severely blocked, blood flow to the extremities greatly decreases. Painful sores or infections develop on the hands, feet and legs. Gangrene can result, and amputation may be necessary. Chronic Venous Insufficiency (CVI): Damaged valves in the veins allow blood to leak backward. When the leg veins cannot effectively return blood to the heart, swelling in the lower legs and ankles and skin damage occurs. Deep Vein Thrombosis: When a blood clot develops in one of the deep veins of the body. Veins of the legs or pelvic area are typically affected. 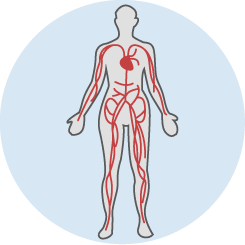 Fibromuscular Dysplasia: A condition that causes narrowing and enlargement of arteries, which can then tear the artery or lead to high blood pressure. Organs that receive blood from affected arteries can be damaged. Lymphedema: Swelling in the legs or arms caused by a buildup of lymph fluid, which is the result of a damaged or removed lymph node. Mesenteric Artery Disease: A very rare disease in which the abdominal arteries become hardened, decreasing blood supply to the intestines. Peripheral Artery Disease: Peripheral artery disease (PAD) is also known as atherosclerosis. Arteries become hardened and cause poor circulation. Pulmonary Embolism: A blood clot in the arteries of the lungs. The blood clot forms in the leg, pelvic or arm veins, then breaks off from the vein wall and travels through the heart into the lung arteries. Portal Hypertension: An increase in blood pressure in the portal venous system. This series of veins carry blood from the digestive system to the liver. Post-Thrombotic Syndrome (PTS): A complication of deep vein thrombosis. Chronic leg pain, swelling and sores can result. Raynaud’s Disease: Arteries in the fingers and toes become suddenly narrowed when exposed to cold temperatures. Renovascular Hypertension (RAS): High blood pressure caused by narrow kidney (renal) arteries. Stroke: When blood flow to the brain is interrupted by a blood clot or when a blood vessel bursts. Thrombophilia: Inherited or acquired disorders that can lead to abnormal blood clotting in the veins or arteries. Varicose Veins: Swollen, twisted veins, often found in the legs and feet. Vasculitis: Inflammation of blood vessels that restricts blood flow. This condition can damage tissue or organs. A healthy lifestyle is important in preventing vascular disease. This includes a balanced, low-cholesterol diet, active lifestyle and avoiding tobacco. People who smoke and those who have diabetes are at the greatest risk for developing peripheral vascular disease, and should make sure to get regular checkups from their heart doctor. In addition to exam-based diagnosis, your doctor may also do an ankle-brachial index (ABI) test. This compares blood pressure in your ankle with blood pressure in the arm using a blood pressure cuff and ultrasound device. You may walk on a treadmill and have readings taken before and immediately after exercising. Other diagnostic tools can also help detect PVD. Vascular ultrasounds examine blood circulation, using sound waves to see how blood moves through your veins and arteries. Alternatively, an angiogram uses X-rays or radio waves to show an image of the heart and blood vessels to study their condition. You should also be evaluated by a cardiologist for your risk of heart attack or stroke. In addition to comprehensive cardiovascular screening, a doctor may perform an electrocardiogram (ECG) to measure how much blood the heart pumps out with each beat. Treatment depends on type and severity of vascular disease. Lifestyle changes or medication may be prescribed by your doctor. In more severe cases, surgery or minimally invasive treatments may be necessary. Bypass surgery can help restore circulation, as can surgical reduction of plaque in an artery through endarterectomy or angioplasty. Without treatment, the tissue in the affected area can die, and amputation may be necessary. Aftercare for PVD depends on type of surgery performed. Bypass surgery is major surgery and will require a hospital stay of up to one week, with a full recovery taking up 12 weeks. Several days of rest are necessary after an angioplasty. Most patients are able to return to work within one to two weeks. An endarterectomy is a same-day procedure with a rapid recovery. For amputation, recovery will focus on wound care and pain relief. Compression garments may be used. Occupational therapy is often prescribed to help the patient adapt.